A tempting treat at the Fair. Bacon wrapped turkey legs. Giant steer. Ferris wheels. Ring toss. Cake decorating contest. Yes, the OC Fair is back, better – and bigger – than ever. This year’s theme is “Free Your Inner Farmer,” but it should be called Free Your Inner Foodie, because the crazy culinary concoctions take center stage—or at least share the stage with a variety of performers in the Pacific Amphitheatre, The Hanger, and on stages throughout the fairgrounds. 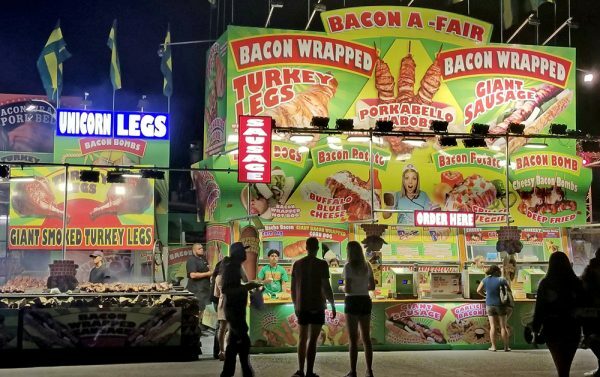 Dining at the OC Fair, running through Aug. 12, means ignoring calorie counting and fat content and giving in to deep fried, bacon wrapped goodies that often defy description. According to the OC Fair, last year more than half of attendees surveyed said the only-at-the-Fair food was their favorite part of their visit. So what are some of the new food items this year? Chicken Charlie’s is known for deep-frying just about anything (their deep fried butter at a previous fair was maybe the most indulgent dish they’ve created). This year, they’ve added filet mignon on a stick. I opted to try their bacon wrapped, deep-fried pickles, served with ranch dressing. The verdict: Yum! The sweet and savory combination was like a party in my mouth. I also sampled their deep fried Oreos, another odd yet satisfying fried dessert. 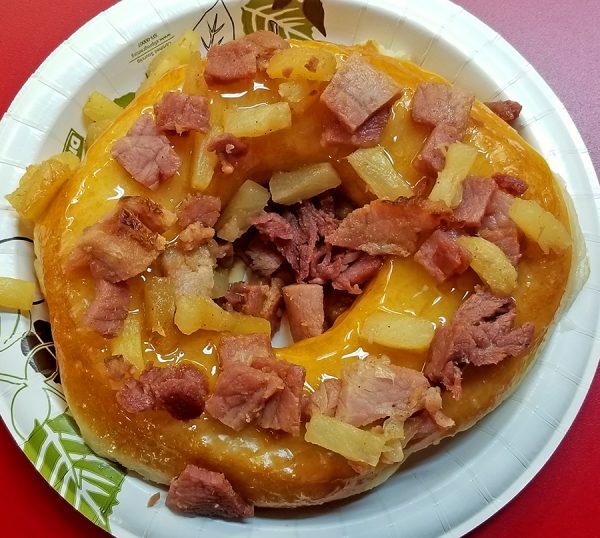 I also tried the Texas-sized donut with ham and pineapple at Texas Donuts, which was also a tasty treat. Again, the savory and sweet combo worked perfectly. The combo of savory and sweet worked perfectly in the Texas-sized donut. The caramel crack fries at Biggy’s features French fries tossed in butter and sprinkled with cinnamon sugar then drizzled with salted caramel sauce and topped with whipping cream and sprinkles (maybe Fruity Pebbles?). The concept sounds interesting and almost works, but my order was light on butter and cinnamon sugar, so despite the whipped cream it was a little dry. That was on day two of the fair, so they should have the recipe fixed by now. And then there’s the deep fried shrimp on a stick at a new stand called Get Fried. The twist—the shrimp is coated with siracha ranch sauce and fruity pebbles. Not easy to execute a meal on a stick, but this one is fairly easy to eat, and delicious. 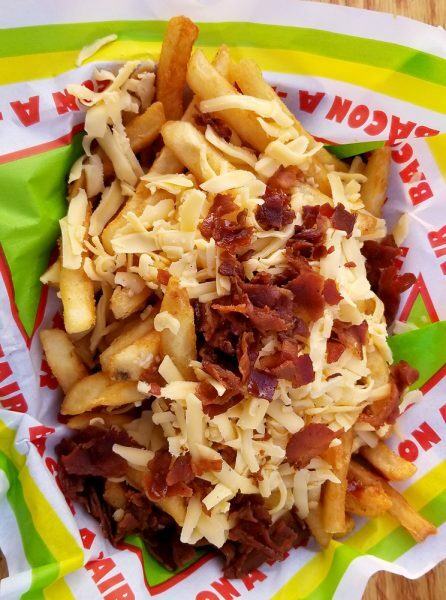 I also ordered one of my favorite food entrees at the Bacon A-Fair: truffle gouda bacon fries, a delicious treat with truffle oil, fresh aged gouda and bacon bits. Other noted dishes: spaghetti donut formed with pasta and topped with pesto, alfredo, carbonara or marinara at Pignotti’s; the OC Crunch cinnamon roll featuring caramel, cinnamon crunch cereal and frosting at D&D Country Fair cinnamon buns; Pine and Swine sourdough bread with butter, garlic, cheddar and mozzarella cheese, pineapple and ham at Ten Pound Buns; unicorn cotton candy donut with sparkling strawberry glitter glaze, rainbow candy, bubble gum cotton candy at Texas Donuts; and of course the giant turkey leg wrapped with a pound of bacon at Bacon A-Fair. Want to taste several decadent dishes without being overwhelmed? Get a sampling of food and treats for only $3 each at most food stands every Thursday from noon to 4 p.m. The samples include funnel cake, tri-tip, lemonade, cinnamon rolls, tacos, gelato, cotton candy and more. Another of my favorite things to do at the OC Fair is visit the wine pavilion and taste award winning wines. Vintners from throughout California enter their wines in the annual OC Fair wine competition, hosted by the OC Wine Society. The judges are mainly winemakers who taste hundreds of wines in a blind tasting several weeks before the fair. The winners are available to taste in the wine pavilion on a rotating basis, meaning that wines you taste one day may not be there the next. More than 50 wines at a time are available for tasting, two tastes for $3. I tasted the wines on two of the days I’ve been to the fair and found several outstanding labels I want to order. Hint—take a photo of the labels of your favorite wines, it makes it easier to find them online. Visit OCWS.org for a list of this year’s award-winning wines. I strolled the main products mall until I found the Ghost Scream hot sauce booth, owned and operated by chef Matthew Sisson and his wife Deandra. They launched Ghost Scream several years ago when they decided to see if they could develop some spicy recipes using the infamous ghost chili pepper yet create sauces that anyone can enjoy. “It’s hot but anyone who craves the heat can enjoy it. Our love for intense flavor and spice brought this hot sauce to life,” said Mr. Sisson, who I chatted with before the fair opened. He and his wife live in San Clemente, but they travel the country and visit fairs to sell their wares, although Ghost Scream has become so popular it is now sold in specialty stores including Irvine Ranch Market in Newport Beach. Their four products: Vindaloo Curry (A spicy curry concoction made with the rare and rambunctious Moruga scorpion pepper), Chili Garlic Paste, Chili Garlic Jam, and the original Ghost Scream Hot Sauce. I sampled the products at the fair, and can verify that they are tasty—and damn hot! And then there is the music. I attended the Happy Together tour concert with The Turtles, Paul Revere and the Raiders, The Association, Gary Puckett, and several other bands that all had massive hits back in the 1960s. A few nights later, it was a concert featuring The Fixx, X, and Psychedelic Furs. I also caught an Elton John tribute band in the Hanger, a fun place to see concerts. The fair offers numerous tribute band shows, all of whom are the best at what they do. The Elton John show was spot on musically and even visually, and had the crowd singing along to Elton’s numerous hits. Upcoming shows in the Pacific Amphitheatre include Toto, Willie Nelson & Family and Steve Miller band. The OC Fair is open Wednesday through Sunday. Admission varies. Visit OCFair.com for more info.